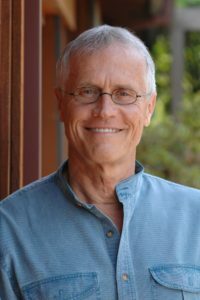 Paul Hawken (b.1946) is an environmentalist, entrepreneur, and widely-traveled speaker based in Sausalito CA, who heads Project Drawdown, based on his latest book, Drawdown—The Most Comprehensive Plan Ever Proposed to Reverse Global Warming (2017), which identifies, maps, and ranks the 100 most substantive existing solutions to address climate change in the next 30 years. The top five: refrigerant management (phaseout of HFCs in refrigerators and air conditioners), onshore wind turbines, reduced food waste, a plant-rich diet, and saving tropical forests. Earlier books include four national bestsellers: The Next Economy (1983), Growing a Business (1987, basis of a 17-part PBS series), The Ecology of Commerce (1993, voted as #1 textbook by 67 business professors), Natural Capitalism: Creating the Next Industrial Revolution (1999, with Amory Lovins and L. Hunter Lovins), and Blessed Unrest (2007, on the environmental movement). He founded the Natural Capital Institute in 2002, re-named as WiserEarth in 2011. As an entrepreneur, Hawkin founded or co-founded the Erewhon Trading Company (1967, for natural foods), Smith and Hawkin (1979, selling upscale tools), and OneSun (2009, for low-cost solar energy). He has received numerous awards, such as Entrepreneur of the Year (1990), One Hundred Visionaries (1995), Green Cross Millennium Award (2003), and Pioneer of Sustainability (2014). For full information, see www.paulhawken.com.